Antioxidant blend: includes key antioxidants such as Rutin, Lycopene, Astaxanthin and Lutein which mop up free radicals and slow down the aging process. Affordable: The Source Naturals products are very reasonably priced. Synthetic vitamin AHigh levels of synthetic vitamin A in the form of beta carotene and palmitate may lead to toxicity if taken over long periods of time. No enteric coating: Enteric coating could have protected some of the more sensitive nutrients from damage by the acid in your stomach, resulting in better absorption. With an Effectiveness Score of 8.1 on a 10 point scale, the Life Force multivitamin by Source Naturals ranks number 11 out of the 100+ multivitamins we have evaluated. Even though it is not the best multivitamin on the market, it provides good value for money and we recommend it for individuals on a tight budget. 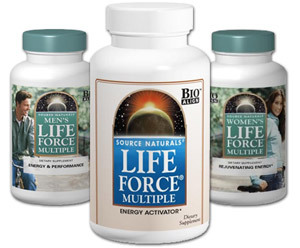 How does Source Naturals Life Force Multiple compare with other multivitamin brands? MultivitaminGuide.org offers comparison between the Source Naturals Life Force Multiple and of all major vitamin supplements available on the market. Some of the unique aspects of this guide include comparison of the Source Naturals Life Force Multiple with 100 other vitamin supplement products, including popular brands such as One-A-Day, GNC, Equate, Kirkland, Shaklee, Nature Made, NOW Foods, Melaleuca, Puritan’s Pride, Herbalife, TwinLab, and Walgreens. The information on this site is the culmination of over 6 years of scientific research and analysis. Each of the reviewed products is evaluated against 4 key parameters, such as composition, bioavailability, potency and safety. Then each supplement is assigned a score from 0 to 10, which enables you to easily compare the effectiveness of different brands. The table below provides a summary of the Effectiveness Scores of some of the more popular vitamin supplement brands available on the market, including the Source Naturals Life Force Multiple. Any vitamin supplement with a score that exceeds 8.0 is considered to be "excellent". For that reason, using a multivitamin product with a score of 8.0 or above is strongly advised.